Blog: 5 reasons why students get late in their assignment submission. 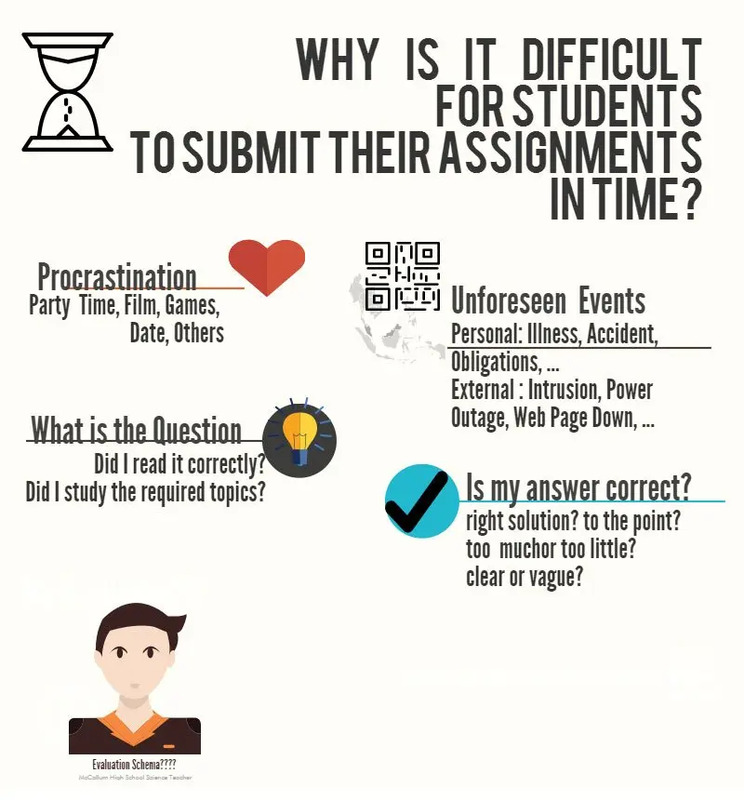 Why is it difficult to submit assignments on time? From the childhood days, the DIN (Do It Now) concept has been dinned into us – that we should finish our tasks at the earliest, if not immediately. As a student, assignment submission is an important and recurring task. Sitting at the right side of the table, I have long since been dishing out assignments with liberal remarks of “or else” to the unfortunate students who are standing at the wrong, receiving end. As Academic administrators, we condescend to dole out measly remissions for “genuine” reasons. When somebody asked to list at least five reasons for delayed submission, the pompous pedagogue in me said: “Why five, only one – laziness”. Soon remorse set in, as I recalled the forlorn faces of sincere student, who, after all, are just children with so much to learn, love and enjoy. I decided to put myself in students&#39; shoes (a bit too tight!!) and think of their hardships. Far removed from student days, I would show that most of the &#39;reasons&#39; are not acceptable. To walk the talk, my write-up, my assignment, will be ready in three days! Did the student-child in me took charge? The know-all part said, I could do this in a jiffy, so why not finish a few other things – Do it Now became Do it Next. Presto, the first reason for late submission: procrastination. Assignments can wait, there are so many other things to do – go to a party, watch a film, attend a fest, etc. Above all, can you afford to miss a date? You don’t have one still? But, what if one comes along at the last minute? Besides the self-indulgent activities and relaxations, there are external happenings which hamper the sincere desire to work on one&#39;s assignments. In the present case, I wanted to go out for a while, return early and start writing. Alas, the car broke down and when I returned home, the internet was down. So the second reason: unforeseen events. They could cause personal constraints like illness, accident, lack of concentration or obligatory commitments. There may be resource constraints like power outage, website going down or the reference material locked up while the person with the key is on leave. When one earnestly, or due to compulsion to complete the course well, sits down to work on assignments, the other factors emerge on the horizon. “Did I get the correct question?” “Do I have the required knowledge?” If not, “Do I have the resources, including time to work on?” “Even if I have the resources, will my inability to manage time while working on the assignment, backfire again?” Copying is no-go, besides demeaning. Discussions with others and clarifying doubts will put a demand on their time. Thus, insufficient knowledge about the assignment (questions and/or solutions) is another cause assuming one understands what is asked, answering might take more time due to confusion about the scope and relevance. The problem may be less severe in derivations and calculations using tools and tables. The difficulty will be in interpretations and expositions, particularly for open-ended questions. After all these barriers, the student has a major demon: the mode, style, language, etc., of the presentation. Is it too concise or too verbose? Have I assumed something which has to be explicitly put? Not knowing the mindset of the evaluator is a handicap. Attending the lectures (especially those which are linked to coursework questions) helps a lot in focusing on important aspects of the question. Knowing the whims and fancies of that person – often he/she is your tutor or professor – is a bigger danger. The curative measures might turn out worse than your natural output. The worry about what and how to present, and when to stop paralyzes the students, making them miss the deadline. But, no more, I know what is missing in the picture and I can make a difference in my next assignment submission. Like great men say, be the change you want in the world. A student can actually bring positivity back. All it takes it a little bit of focus and shedding off laziness. A student can easily transform their lives with the help of yoga and meditation. These are some additional Productivity Tips to help you in your pursuit of never being late again for an assignment submission. This entry was posted in Student life and tagged assignment submission, late submission, procrastination, time management. Bookmark the permalink. ← How to Write a Dissertation? How student loan refinancing can save you thousands of dollars?